For my second set of shadow weave samples I used one pattern with different types and colors of yarn. I chose figure 30 from page 43 of Powell’s 1000 (+) Patterns. The main reason I chose it was because the pattern repeat had only 16 ends. This was desirable as I wanted a fairly narrow sample on which I could experiment. All the samples were treadled the same. The first samples (on left) are shadow weave and a switch drawdown. 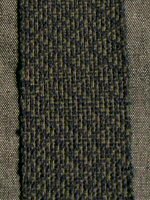 In the (regular) shadow weave sample, the weft colors follow the warp sequence of dark, light. In the switch sample, the sequence is switched. Looking at them now I couldn’t tell you which was which, so I'll leave you to guess on your own. 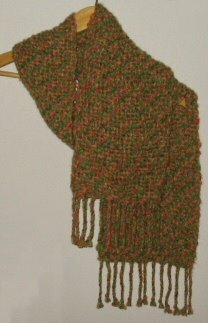 I used green and purple yarns of similar value, so the patterns are not especially easy to see. In fact, while weaving, I couldn’t see the pattern at all! It wasn’t until I took it off the loom and stepped back that the pattern emerged. With this same warp I next wove the samples on the right, replacing the green weft first with a light brown and then with a dark. I really like the look of these, especially the light one. I also tried a couple of variegated wefts, which you can see in Rascal’s picture above. However I didn't care for these. This first warp was an acrylic worsted weight knitting yarn. I'm not sure why I like to use this for weaving samples. 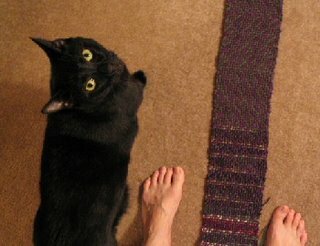 I know I definitely don't like to knit with it. But it's thick so it warps and weaves quickly. Plus it's inexpensive, readily available, comes in lots of colors, and gives me a chance to decide if I want to weave the same thing in a serious yarn. Continuing with this same threading, I next tied on some cotton yarns next, using an 8/2 black and a 16/2 green. I chose these because they are the only cottons in my stash which match some large scraps of store bought fabric I have on hand. I thought perhaps I could weave fronts for a jacket or vest and wanted to see if I could use these two sized yarns together. Again I couldn’t see the pattern until I stepped back. Happily, the two yarns worked well together, though I will choose a different pattern if I ever do weave anything with them. Lastly I tried some bulky designer type yarn I found on sale at Hobby Lobby; Yarn Bee’s Icelandic Jewels. I’m not sure why I chose these colors, the orange is very unlike me. I tied on again, this time with enough to weave a scarf. And here’s the scarf which I’m not much impressed with. From a distance the colors (which aren't very accurate here) muddy each other out, though someone who likes brown might not mind. So far I like my first shadow weave samples from the previous post best. Partly because of the colors and partly because I like the drafts better. Even so, these samples are valuable to me. Perhaps not so much for what works, as for what doesn't work. I've learned some things about color and I've learned a little more about shadow weave patterns. 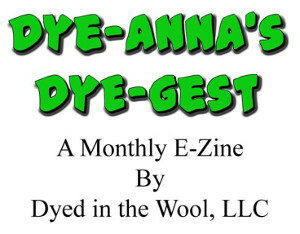 Hopefully I can utilize this new knowledge as I decide which patterns and yarns to use next. Can't keep up with you! I like the purple and green (similar values) because of the subtlety. There is something to be said for things (like scarves) coming into focus as you come closer to them, and vice versa. And, I very much like the orange and green. The pattern does show but, despite the color, in a slightly subtle way. So, though you don't like the particular colors, think about using colors you might like for similar kinds of effects. Yes, the samples will be very important for you. I hope you are keeping notes & records with your samples. 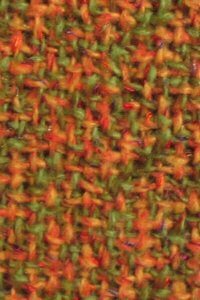 Include the details of the warp, weft, measurements: on loom, off loom, and after washing. Then the general impressions you've written in your post. My beginning weaving teacher insisted on us making sample sheets w/ a swatch attached. Now I have a huge shelf of weaving sample notebooks that are invaluable to me.